Heat 1 tablespoon peanut oil in a large fry pan or wok over high heat. Add mushrooms and cook for 2 minutes or until slightly softened. Set aside on a plate. Return pan to heat with remaining 2 tablespoons oil. Add pork and use the back of a masher to break apart in pan. Cook until browned then add white part of shallots, ginger and garlic. Cook, stirring, for a further 3 minutes. Add oyster sauce, ¼ cup soy sauce and 2 teaspoons sesame oil and mix to combine. Add water chestnuts and return half the mushrooms to pan then stir through. Stir through half of the green shallots and set aside. Prepare noodles as per packet instruction. Drain and rinse under cold water. 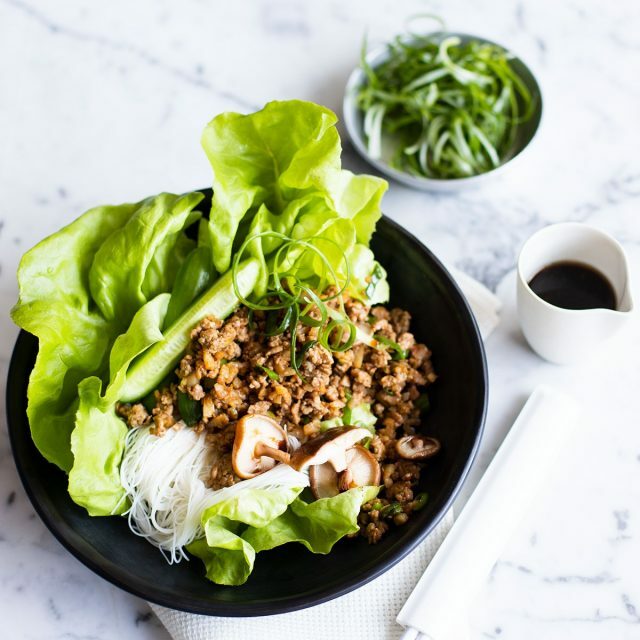 To make the dressing, combine remaining 1 tablespoon soy sauce, 2 teaspoons sesame oil and lemon juice in a bowl. To serve divide lettuce between bowls. Add mounds of noodles, spoon over sang choy bow mixture, and finish with cucumber, reserved mushrooms, and green shallots. Spoon over dressing and serve remaining alongside.